First on tonights bill are Solsikk, an up and coming local band. Unfortunately the doors of the venue are only opened ten minutes before they go on stage, so their opening song is played to a small audience, but thankfully this quickly grows and before long they are playing to a good sized crowd. Solsikk are definitely the heaviest band on the bill tonight, but this doesnt put the crowd off and they got a great reaction from the audience. Throwing copies of their debut EP (containing 4 of the 6 tracks played in the bands set tonight) into the audience also went down well - fans love freebies ! For a young band playing one of their biggest gigs to date, Solsikk looked very confident and relaxed with no sign of nerves, and they looked at home on the large stage - some bands used to smaller venues struggle on a large stage, but singer Vykki Turner in partiicular made full use of the space to move around and interact with other band members as well as the audience. Guitarist Chris Webb impressed with his blistering guitar playing, made even more impressive by the fact that he was effectively playing blindfold as his face was hidden by his hair for most of the set. Drummer Matt C, and Bassist Mark Mulcaster also put in a good solid performance producing the perfect music for Vykki Turners powerful vocals. An excellent performance from this young band. Second on the bill are French band Markize, the main support for Tarja's european tour. Russian singer Alina makes her entrance shortly after the rest of the band start the first song, and captures everyones attention in an eyecatching dress (of her own design). As she starts to sing she quickly shows that she isnt there because of her looks - she's on that stage because she can sing. Markize play a mixture of songs from their current album Transparence, and songs from their new album due to be released around the end of the year. Markize do songs in French and English tonight, but whichever language Alina is singing in doesnt seem to bother the fans who enjoy both french and english songs. A few fans look stunned at first when the band break into Lady Gaga's Bad Romance (shown as "Romance is running out" on their setlist), but clearly enjoy hearing a metal version of this well known song. A great performance from Markize which will certainly have earned them some new fans in the UK. As the time nears for Tarja to take the stage, the excitement levels are visibly building. This is only the third solo visit for Tarja since leaving Nightwish, and the first since her new album, "What lies beneath" was released. Her last visit was at a packed out Islington Academy in October 2009, so the Shepherds Bush Empire is a significant step up in terms of size. Sadly the crowd comes nowhere near filling the venue with the upper two levels closed off, and the ground floor nowhere near full. Despite this the crowd is still a decent size, particularly for a midweek gig. Tarja took to the stage to loud cheers from the crowd, and went straight into a superb performance of Dark Star, one of the tracks from her new album. Tarja has a fantastic voice and its in fine form tonight coping perfectly with the heavier songs and the more oepratic ballads equally. 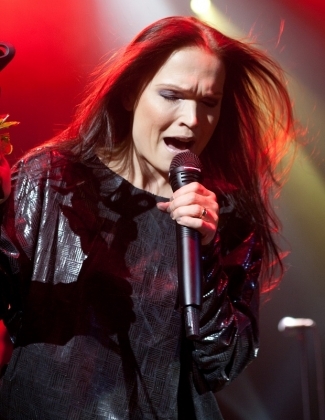 Tarja is clearly enjoying herself as she performs and interacts with the crowd, even taking a rose given to her by one of her fans. The first costume change comes afer just three songs with more clearly to follow. 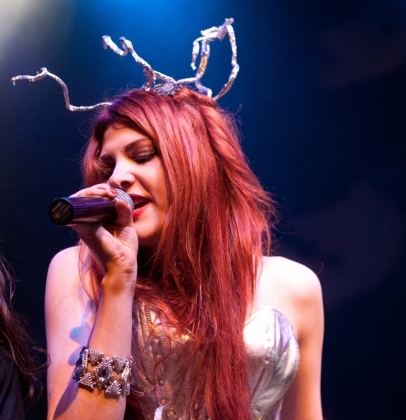 After some newer songs, the fans are clearly thrilled when she sings "I walk alone" from her first album "My winter storm", with many fans singing along. As the song ends, the band go off leaving just drummer Mike Terrana to play a drum solo on his huge drumkit. This then segues into an instrumental when the rest of the band (Christian Kretschmar on Keyboards, Kevin Chown on bass, Alex Scholpp on guitar and Max Lilja on cello) return to pay "Little Lies". Including Max Lilja (ex Apocalyptica) on Cello is clearly a masterstroke as it really helps make the bands live sound far richer than it would otherwise have been. Tarja rejoins them after another costume change to sing Little Lies with them. After a couple more songs, they move into a medley of three songs - "Lappi", "Damned and Divine" and "Our great divide", with Tarja playing keyboards for part of the time. "Ciarans well" and "In for a kill" bring the main part of the set to a rousing finish before Tarja and the band leave the stage. The fans clearly want more and chant Tarja's name loudly till she returns for the encore. The encore kicks off with a song from Tarja's time with Nightwish - "Where were you last night", but tonight she chooses to play around with the lyrics, including playfully incorporating segments of other songs - Belinda Carlisle's "Heaven is a place on earth", and the Bon Jovi classic, "Living on a prayer". Tarja is clearly enjoying herself tonight, and that enjoyment and enthusiasm transmits itself to the crowd. The encore then consists of "Until my last breath" and ends with the song many fans were waiting for - "Die alive". An excellent performance from Tarja tonight who has shown that she is able to play a set consisting of almoster entirely her own solo material with very little reliance on the old Nightwish songs that she relied on in earlier parts of her solo career. This was the last night of her tour (her european tours always seem to end with a London date), and was an great night for the fans who attended.